Professor Layton and the Miracle Mask is a puzzle adventure video game developed by Level-5. It is the fifth game in the Professor Layton series, the second in the prequel trilogy of games, and the first in the series to be developed for the Nintendo 3DS. 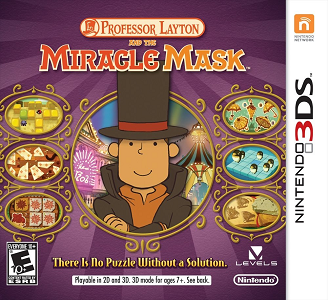 Professor Layton and the Miracle Mask Plus, an enhanced edition featuring new puzzles and added cutscenes, was released on the Nintendo eShop in Japan. Professor Layton and the Miracle Mask runs full speed most of the in Citra. Graphically, the game suffers from minor issues, but requires low to mid-end hardware to obtain full speed. It suffers from minor audio issues at times, but this does not hinder gameplay in any way. Some slowdowns happen when multiple 3D characters are being rendered in the scene. The game can be played from start to finish without problems.